OUT AND ABOUT . . . . . . . . . . . . . . . . . . . . . . . . . .
Coombe Trenchard in Devon is very dog-friendly. It's fun visiting other people's gardens - although if taking your dog along, keep a close eye on him and don't allow him to run riot round carefully tended plots. There are also many landscape gardens which are dog-friendly - although understandably, you are usually asked to keep your pet on a short leash. As well as making an enjoyable day out, going on such outings can also provide a bit of inspiration for projects to try in your own garden. 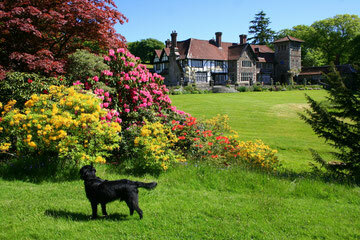 Coombe Trenchard in Devon is stunning and well worth a visit if you are in the area - and shows brilliantly that dogs and beautiful gardens can be successfully combined, as the owners have several themselves. Another of my favourites is Stowe Landscape Gardens. As well as the more obvious follies there are any number of hidden little treasures tucked away and just waiting to be discovered. You can find out more about these and other gardens to visit on the Links page. Do you have any favourite places you visit with your dog? Let me know and I'll include them here!